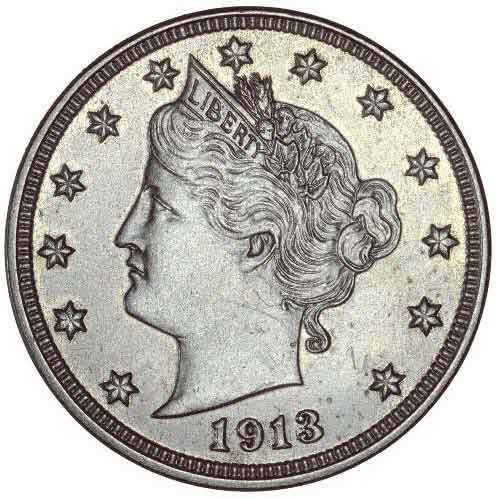 1913 Liberty Nickel: $3.7 million – Five 1913 Liberty Head nickels were made, and at one time all were in the possession of the famous coin collector Edward Howland Robinson "Ned" Green, also known as Colonel Green, who owned all five of the coins late in his life. The 1913 Liberty Nickel was the first U.S. coin to surpass the $100,000 mark in 1972, and the first to eclipse the $1 million mark in 1996. 1916/16 Buffalo Nickel: $3,950 – The 1916/16 doubled die obverse Buffalo nickel is one of the most popular error nickels around and easily approaches $4,000 in Good-4 Grade, making this one of the most valuable nickels, aside from the 1913 Liberty nickel. The number of doubled die 1916 nickels is hard to determine, as the mintage was rolled into the issue’s original output of 63,498,066. Only several dozen may exist, more or less. But, whatever the total number of 1916/16 Buffalo Nickels happens to be, this is without a doubt one of the greatest rarities of the 20th century. 1877 proof Shield Nickel: $2,100 – In 1877, the nickel was struck only in the proof variety, though many escaped into circulation and therefore exhibit signs of wear. The price listed here is for an example in Very Fine-20 grade on the Sheldon Grading Scale. While 900 were made, most assuredly far fewer survive today. 1878 proof Shield Nickel: $1,100 – Much like the case of the 1877 nickel, the 1878 nickel was also struck only in proof. Many entered circulation, and is represented in price here as a Very Fine-20 Grade variety. 1918/7-D Buffalo Nickel: $1,000 – This overdate Buffalo Nickel is one of several in the series and definitely one of the scarcer nickels of the 20th century. The $1,000 price quoted here is for an example that is graded as Good, though expect to ante up even more for a higher-grade example. 1936-D 3½-legged Buffalo Nickel: $750 – Over-polishing of the reverse die led to this popular variety, which is coveted among all Buffalo Nickel collectors. The price listed here is for an example in a grade of Good-4. 1885 Liberty Head Nickel: $585 – The 1885 nickel is the key to the Liberty Head series and a piece that is quite difficult to find, regardless of the grade. Only 1,476,490 were made, and only a fraction of that figure still exists. As with any of the dates in this most valuable nickels guide, be sure that if you buy an 1885 Liberty Nickel that it’s been certified by a third-party coin grading firm. The price quoted here is for an example in Good-4 Grade. 1937-D 3-legged Buffalo Nickel: $535 – Just as was the case for the 1936-D 3½-legged Buffalo Nickel, over-polishing of the die caused the virtual removal of the Buffalo’s front leg on this piece. Expect to pay a shade over $500 for an example grading Good-4. 1880 Shield Nickel: $500 – Only 19,995 nickels were made in 1880, and only a small number of them still exist today, making this one tough cookie to find in any grade. The price listed here is for an example in Good-4 grade. 1879 Shield Nickel: $390 – Shield nickels of the late 1870s and early 1880s were made in very small numbers, and such was the case for the 1879 nickel. Just 29,100 were struck, and just a small number of those survive to this day. The $390 figure here applies to examples in a grade of Good-4.